In a recent interview with Reuters, Thomas Ko, global co-general manager of Samsung Pay said that the mobile payment platform will get support for online shopping in 2016. Furthermore, Ko said that the payment platform will also be extended to more Samsung smartphones in the upcoming months. 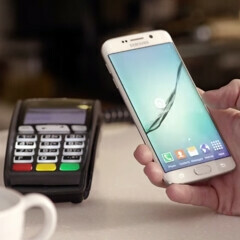 When it comes to the mobile payment market, Samsung finds itself in a very interesting place. Despite the fact that Samsung's payment solution has a huge advantage in being able to work with most magnetic-stripe payment terminals, Samsung Pay is lagging behind its competitors in regards to card issuer compatibility. At the moment, it's unclear what this move to online shopping would entail for Samsung Pay. Most likely, Samsung will allow Pay users to place payments through a browser. Such a feature would place Samsung in direct competition with PayPal, and would represent a very bold ambition for Samsung. At the moment, Samsung Pay is only available in South Korea and the United States. In the interview, Ko also said that the platform is about to expand to more countries, but so far, the list of new territories and specific release dates are still to be unveiled. Previous rumors said that Samsung Pay will launch in China, the UK, and Spain during the first quarter of 2016. Still the best payment system right now. Despite the fact that retailers are liable for fraud if they don't upgrade their CC terminals, most haven't. I use my phone all the time to make payments. Most places I pay at have swipe only readers and only Samsung Pay works. Many time I get either funny looks or amazement from the cashiers when they say it won't work and then it works. Happened twice today in fact. I have been using my Samsung Pay everywhere since it was introduced. I always get the same reactions as well. Most of the time, people tell me that it wouldn't work in their stores, but I tell them it is a Galaxy and not as iPhone. I have never had any issues do far. Just ignore the iAlikMalix basher! Most of those are merchant and account services. Only a few can be called a "bank". Luckily all the CCs I use are supported (Chase, Citi, Amex). The only really big US bank I can think of that is not is Wells Fargo which I don't use. At least I can use it at about 80-90% of the places I shop at including mom and pop shops which still use swipe readers.